That was probably my favourite ever tagline for Gap. Nowadays, the might be lacking the genius tagline, but they are more than making up for it with amazing faces in their campaigns. Fall 08 has been subject to much speculation, from everyone from Chanel Iman to *gasp* Scott Schuman. 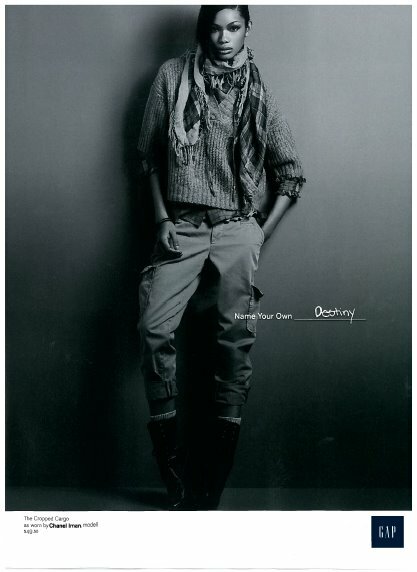 Division Street has just posted 4 adverts – Chanel Iman, Georgina Chapman, Lily Donaldson (yippee!) and Julia Restoin-Roitfeld. 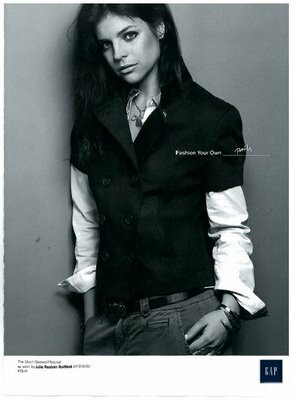 Can you imagine Carine Roitfeld shopping at Gap?! I heard that baby suri ( cruise’s daughter ) is modelling for gap!!! I hoep she does! She is so damn cute! some of my fave people yay!! these ads make you want to run all the way to Gap!! I can’t believe Julia is in a gap ad! she and Georgina look fab.